What’s the first thing that comes to mind when you think of Alaska? Maybe you picture stunning mountain ranges bordered by thick forests of pine and birch on one side and fields of snow-covered terra firma on the other? Perhaps you visualize ice sheets that stretch up beyond the Bearing Straight out into the Arctic Ocean where Eskimos once harpooned whales from canoes and open drift boats? Or maybe when you think about Alaska you see open spaces free from confining indoor walls and the environmental spoils of suburban sprawl? No matter what your imagination conjures up, the reality of Alaska’s wilderness is still larger. Boasting more coastline than all other U.S. States put together, it’s a place where men and women still go to “Get lost.” Fact is, Alaska remains so attractive to the rugged individualist that its capital city, Juneau, can only be accessed by sea or by air. It is the very untamed nature of this great beast that makes it so alluring and so mysterious. Despite the ever growing popularity of its increasingly cosmopolitan cities and towns like Anchorage, Nome, Bethel and the gorgeous Hooper Bay, it’s a land that shall remain forever wild. Outside of these small pockets of civilization lie more than twenty million acres that make up the Arctic National Wildlife Refuge. These territories are filled with a cornucopia of wild animals like brown bear, moose, caribou, bald eagles and more, its countless freshwater rivers, lakes and estuaries are stocked chock full with fish– enormous freshwater game fish including sockeye salmon, king salmon, Arctic char and the largest, most colorful rainbow trout on earth. In a land as vast as Alaska, where’s the best place to fly fish? Take your pick. You can go north to the Brooks Range where bush pilots will fly or chopper you to some of the most remote unspoiled lake country in the world. Or you can head west towards the remote Alaskan Bush–an area that also encompasses more than 380 native villages. One of the more accessible areas to fish Alaska is the Kanai Refuge, or what’s better known to the natives as “Alaska in Miniature” because of its natural beauty and abundance of wildlife. Located in the lower part of the state to the immediate north of the Gulf of Alaska, the mighty Kanai River sports some of the most exciting salmon and trout fishing on the globe. What’s more, it’s accessible by car from Anchorage. Alaska is all about fishing big, fast flowing rivers which means contracting the services of an expert guide. Why? The answer is twofold. 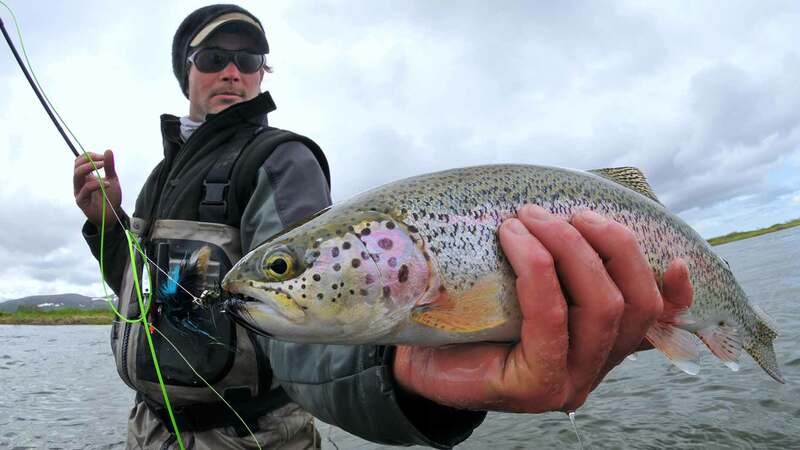 Not only will licensed fly fishing guides lead you to the most productive fishing waters in your selected territory, they also know what it means to fish Alaska safely. This rugged land may be beautiful in its natural splendor, but it can also be deadly for the more uninitiated outdoorsman. Many guide services offer multi-day, all inclusive fly fishing packages that include all the fishing equipment you need plus lodging, meals, ground, water and air transportation. You’ll want to do your homework months in advance of your trip and prearrange your Alaskan fly fishing adventure before leaving your hometown. You can either get in touch with reputable guides and outfitters online or you can leave it up to a licensed travel agent who can book you a package that not only includes guide services in Alaska, but also your flights to and from the state. What will a guided fly fishing package typically not include? Most outfitter and guide websites offer vital information that above all stresses individual “comfort.” Let’s face it, if you’re not comfortable, you’re going to have a miserable experience. Keep this in mind: Alaska is, by nature, a cold damp place that’s surrounded on all side by water and ice sheets. Nothing can be more cold and damp than a day spent on a river or a far away lake even in the dead of summer. Alaskan weather, at its best, is unpredictable. Bring the best quality raingear you can purchase along with a waterproof jacket, preferably with a fleece lining. Long underwear, wool socks, hats, gloves and hiking boots are absolute necessities. Some additional items you want to remember can include a video/still camera, polarized sunglasses, two wide-brimmed hats (in case you lose one on the river! ), binoculars, snacks, and your fishing license (again, most outfitters will not provide this for you). While fish are generally hunted from out of open, motorized drift boats, it’s not uncommon for guides to suggest that anglers abandon the boats to cast from shore or even to wade. Some of the best sockeye salmon fly fishing is accomplished by wading in shallow, slower moving water. If you’re a novice fly fisherman, don’t sweat it. Most guides have patience and are concerned with only one thing: making certain you land fish. If fly fishing is too daunting a task for you, more than likely you will be provided with an easy to use spinning outfit. Grizzly bears and wolves Worried about them? Don’t be. Like the old saying goes: these wild creature are more afraid of you than you are of them. In general, they tend to avoid the human presence. Think of a potential run in with the wild side like this- if you’re lucky enough to spot a bear or a moose or a gray wolf- have your camera ready. Much like having the opportunity to experience guided fly fishing in Alaska, it will be a once in a lifetime photo op you’ll cherish forever.